I decided to make my project progress finishing a bunch of projects I have around that are only half done that I abandoned for various reasons. You know, loss of interest, missing a something I need to buy, things I just got tired of doing, etc. 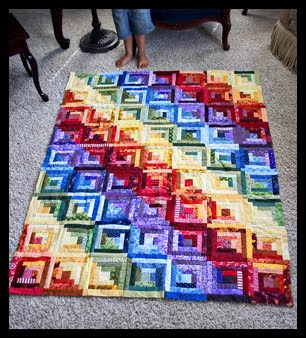 I would love it if you want to join me in this next month in getting all those half-finished projects done! I started piecing it last winter. 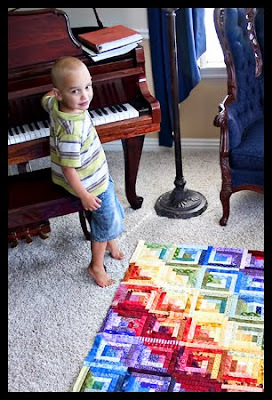 It's all done from leftover scraps from other quilts we've done over years. I stopped because I couldn't find a border I liked to finish it. Griffin said he wanted it and I had no objection, except I was thinking of some sort of rainbow print as the border and I couldn't find one that wasn't girly or had the right colors. Griffin hanging out with his future quilt: On Tuesday I set off to find something that would work. I first headed to American Quilts, which is a little quilting shop not far from our house. Although I would gladly take a yard or two of every fabric in there--they didn't have anything that would work. I managed to walk out of there without buying anything. I feat of strength that proves I'm super-human because they carry Amy Butler fabric. I headed off to the much less trendy Hancock Fabrics and settled on these. 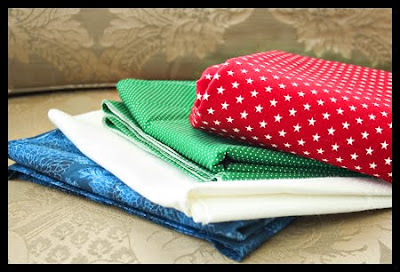 The blue is the binding, the white a border, the green a wide border and the stars the backing. I was about a yard short in the backing fabric. That's what happens when you try to guess yardage for a backing. I should have sat down and figured exact measurements, but yeah, didn't take the time. I made it work (Project Runway starts soon!!) and pieced the back together. It ended up looking quite neat. Then I enlisted my mom to make the quilt sandwich. I started quilting, but the machine started protesting and getting a cough. I stopped and conceded it needed the doctor's. My mom dropped it off and we should have it back on tomorrow. I'm disappointed because I got it about half way quilting and I really wanted to finish it for today. Hopefully next week. I should probably join you! I've got a quilt to finish up and I've been wanting to make pillows out of leftovers from Hy and Maddy's quilts and I've got dresses/skirts to make for Maddy and, and, and... YES! I need to do this LOL! 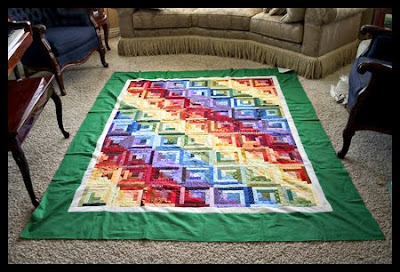 Wow, this is a beautiful quilt! Ummm...I should be shocked that such a beautiful creation came out of anyone at all, then I remember it is YOU and know that anything is possible. It really TRULY is a great quilt.